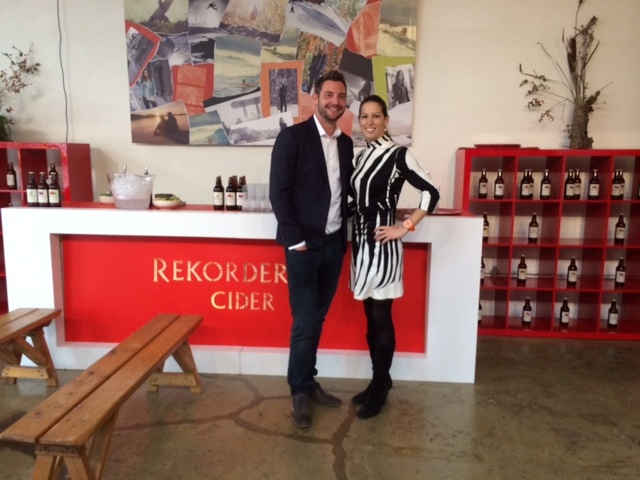 Today I went to a launch event for Rekorderlig Hard Cider, (pronounced rek-order-lig). The are currently launching the their Hard Cider in the US. Truthfully, I had no idea what to expect. Cider’s never been a priority of mine. But here’s the thing– I learned I am a HUGE fan. Maybe it’s Rekorderling, maybe it’s just cider, but I am a fan. I really think this brand has legs. The only other hard cider I can think of by name is Woodchuck cider, and I’m only in the mood for it very occasionally. 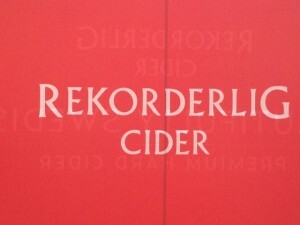 Rekorderlig is a Swedish company. The word is a Swedish adjective that means reliable, trustworthy and down to earth. This name is fitting. Every bottle of Rekorderlig is made with pure Swedish spring water. And that’s important to them, as it’s printed on every bottle’s label. It might be one reason why I loved it so much too. 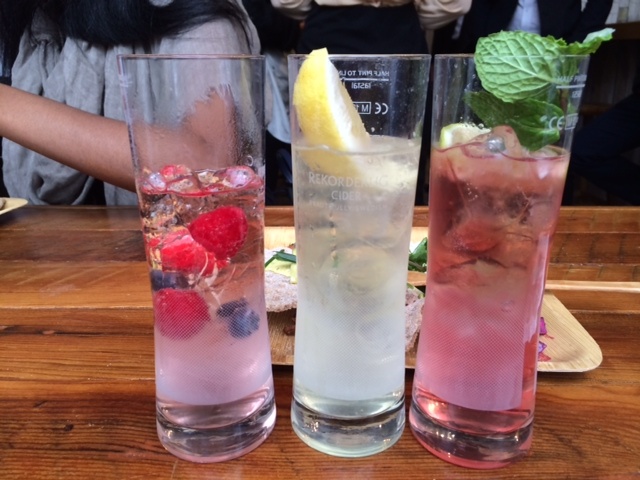 The drinks is refreshing, crisp and absolutely delightful. Both the men and the women in the room liked it equally. Here’s a shot of the three flavors I had. Pear, Strawberry-Lime and Wild Berries. At first taste the “Wild Berries” was great, but it was the “Pear” that had me at Hello. As Dr. Seuss would say, I’d drink this outside, I’d drink this inside, I’d drink it on a boat, I’d drink it on a goat… you get the idea. But really, I’m not exaggerating. It’s quite good. YES!! 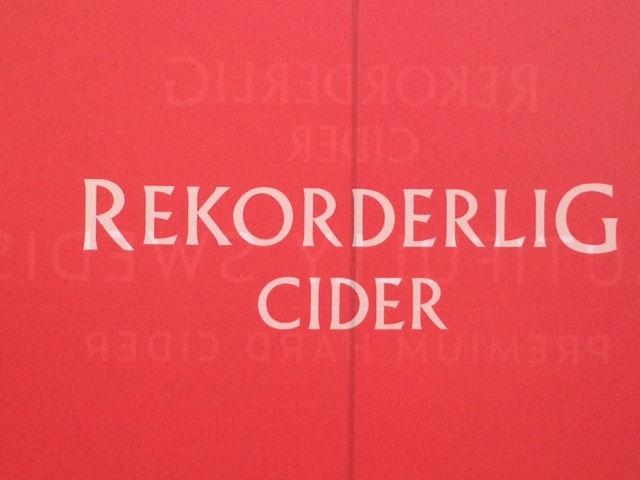 Rekorderlig Hard Cider is going to be a great brunch-time drink. I always encourage people to think beyond the mimosa and imagine a lot of men and women would go for this. I can envision people ordering pitchers of it. Some would like how “light” it is, and those that think mimosas are too sweet would probably love this. It’s got a 4.5% alcohol content, so for those that don’t want to get too crazy boozy at brunch might find this the perfect beverage. A little alcohol, but not a lot. The flavors are subtle and wouldn’t overpower great brunch food. I admire the two founders and their entrepreneurial drive. This is a picture of me with one of them, Gareth Whittle. I wish him and the Rekorderlig US team the best. In fact I think it’s very probably that I will seek them out to partner on a couple BrunchCritic events. I look forward to those conversations!